Although cart abandonment is a huge ecommerce problem, you can easily decrease its influence on your business by using proper third-party extensions. Check the following two posts to discover the most reliable Magento 2 abandoned cart email software solutions the ecosystem provides: Magento 2 Follow Up Email Extensions Comparison & Magento 2 Shopping Cart Abandonment. Below, we shed light on the module that is specified in both digests – Amasty Abandoned Cart Email for Magento 2. Install the tool, and the encouraging Magento 2 cart abandonment email will be automatically sent to a customer every time he or she leaves a shopping cart without proceeding to checkout. 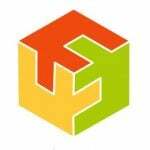 Functionality to comply with EU GDPR requirements. All these features look great, but let’s see how the re-engagement mechanism provided by the Amasty Abandoned Cart Email Magento 2 module helps to solve Magento shopping cart abandonment issues. First of all, you need to select a Magento abandoned cart email template. Note that it is highly customizable, so your message can be really engaging and motivating. Next, create a dispatch schedule. One email is often not enough to make a visitor return to your store and finish the purchase. Sometimes, it is necessary to send several messages and attach a discount coupon to add an extra layer of motivation to decrease the influence of Magento cart abandonment. The last key step in your fight against cart abandonment is related to various specific conditions that can be configured in the backend. Don’t ignore this step since it allows you to create highly-targeted reminders which work much more efficiently. With the flexible dispatch functionality, you can easily create various conditions for sending emails (as well as cancel them), set up a schedule for sending reminders, and use a test mode to see how everything works. Besides, you will be able to monitor the performance of your campaigns and moderate messages that are already in the queue. As for highly customizable email templates, they let you choose how to show products: you can display all products from an abandoned cart in the remainder as a grid or in the form of a list. Furthermore, it is possible to show such configuration options as color and size. 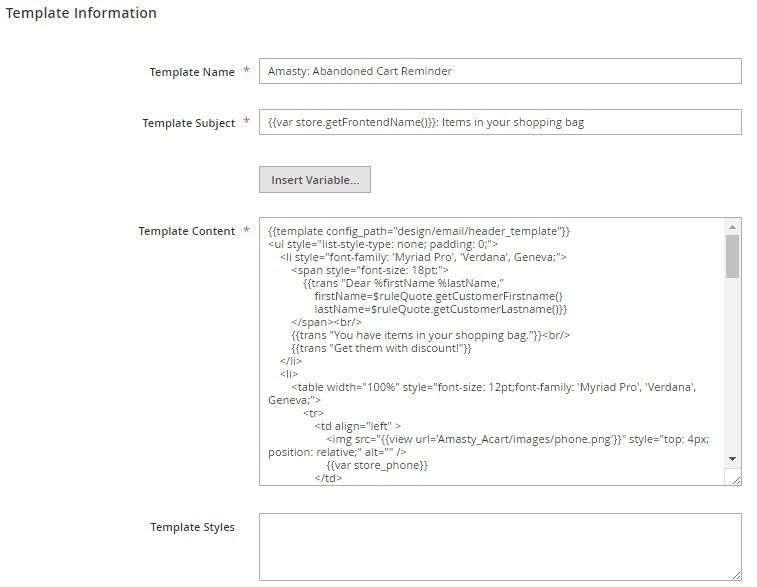 Also, note that Amasty’s Magento 2 abandoned cart reminder extension allows using variables to make your message more personalized. 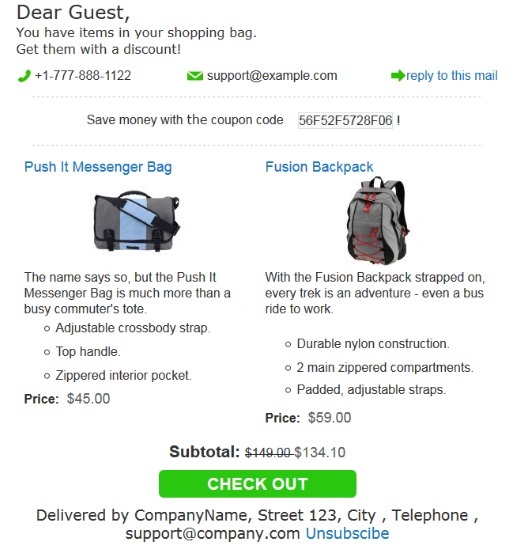 Moreover, to re-engage visitors to return, you can display a new cart subtotal with a discounted price. As for a link to a shopping cart, it is provided in a reminder as well. Now, when you know about the key features of the Amasty Abandoned Cart Email Magento 2 extension, let’s discover its backend functionality and appearance. First of all, we’d like to tell you how to configure the module. Go to Stores -> Settings -> Configuration -> Amasty Extensions -> Abandoned Cart Email. All settings are split into five sections: General, Email Templates, Testing, Debug (For Developers Only), and Blacklist. In the General section, first of all, you can disable coupon usage for different customers. Set “The coupon is available only for particular customer” to “Yes”, and only the reminder recipient will be able to use the coupon you provide. By enabling the “Trigger a rule no more than 1 time per quote” option, an abandoned cart email will be sent only one time no matter the cart conditions. 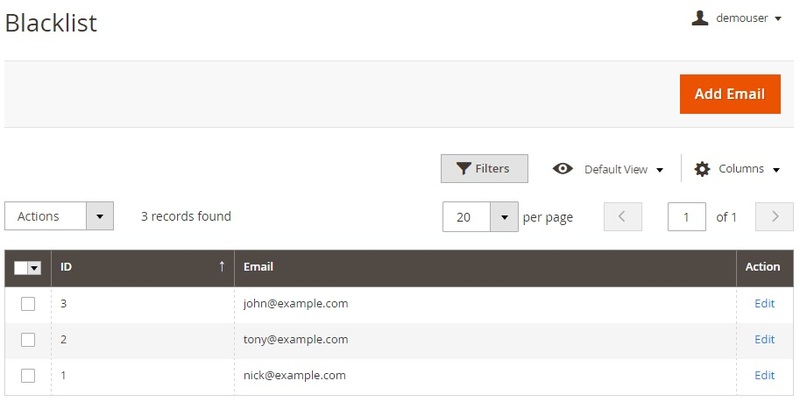 Next, you can decide whether to send emails to registered customers only or everyone. We recommend you to send them to guests as well. 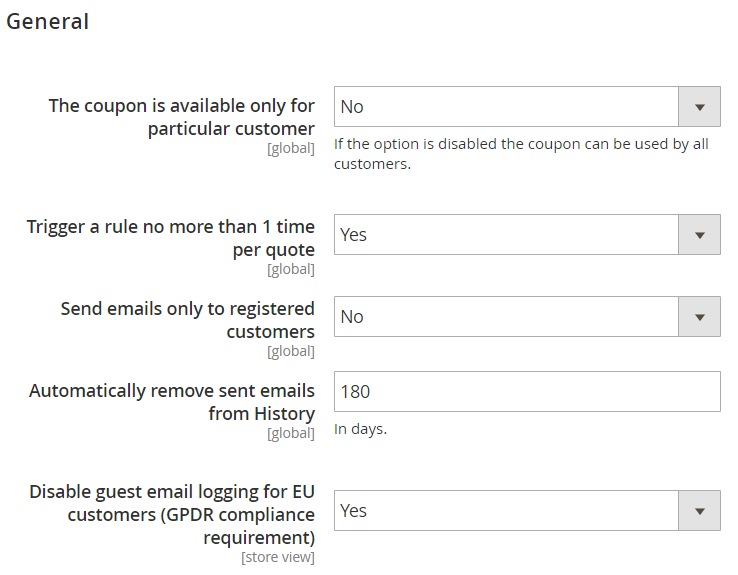 Then, you can specify the period after which to remove sent emails from the log and enable/disable saving emails of the guest customers from EU. In Email Templates, specify a sender name and email. Besides, you can specify an alternative email address to which to send a copy of all emails. Also, here you can enter a recipient’s email and name for Reply To field. The Testing section allows users to disable sending reminders to customers to check the functionality of the module. Don’t forget to specify a recipient to test how well your reminders are. In the next section, you should specify email domains for defining the emails triggering debug mode. Enabling debug mode will allow you to check how the process of sending abandoned cart emails works. In Blacklist, you can import a file with blacklisted email addresses. Now, go to Marketing -> Abandoned Cart Email -> Rules. You can find all your rules gathered in a grid here. The grid shows whether the rule is active or not, displays its name and priority, as well as allows editing rule details. On the same page, you can add a new rule. Let’s see how a rule page is designed on the example of the Cart >$100 rule. The corresponding page contains six tabs: General, Stores & Customer Groups, Conditions, Schedule, Analytics, and Test. 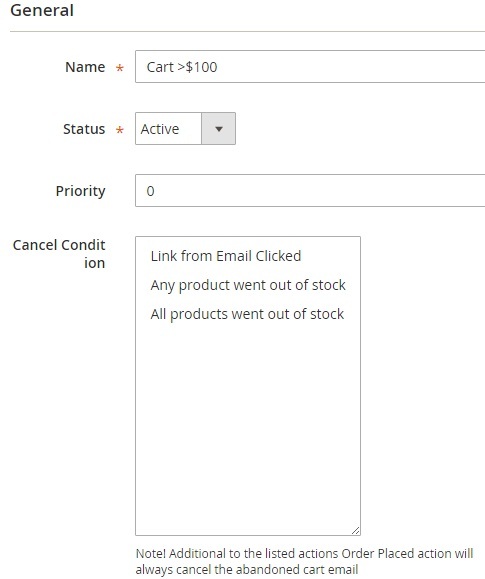 Under the first tab, this Magento abandoned cart extension allows you to modify/specify rule name, select a status (Active/Inactive), set priority, and choose a cancel condition: Link from Email Clicked, Any Product Went Out of Stock, All Products Went Out of Stock. Despite the selected conditions, a placed order will always stop the reminder chain. The Stores & Customer Groups tab is divided between two sections. In the first one, select store views where to apply the rule. As for the second section, the abandoned cart Magento extension contains a list of customer groups here. 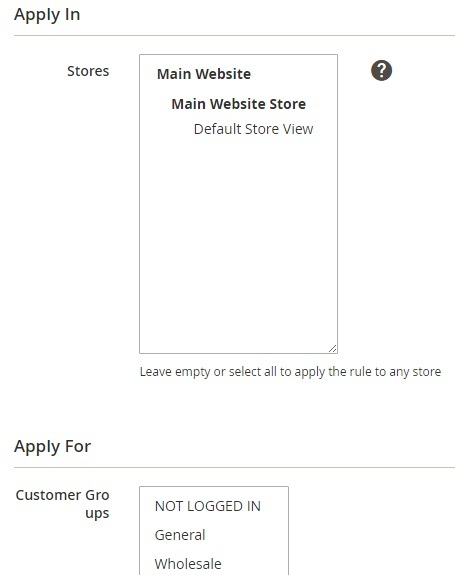 Leave empty or select all to use the rule for any customer group. As mentioned above, the Conditions tab is a place where you can make each rule more precise. In our example, there is the only condition – a cart subtotal must be greater than $100. If the subtotal of the abandoned cart is less than $100, the remainder won’t be sent. Now, it is necessary to describe all details related to the Schedule tab. Here, you can create a chain and emails linked to a particular schedule. 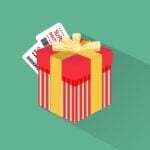 For each reminder, it is possible to select an email template, specify the delivery time (the number of days, hours, and minutes after the abandonment), and configure coupon usage (choose its type and discount amount + enable shopping cart rules). 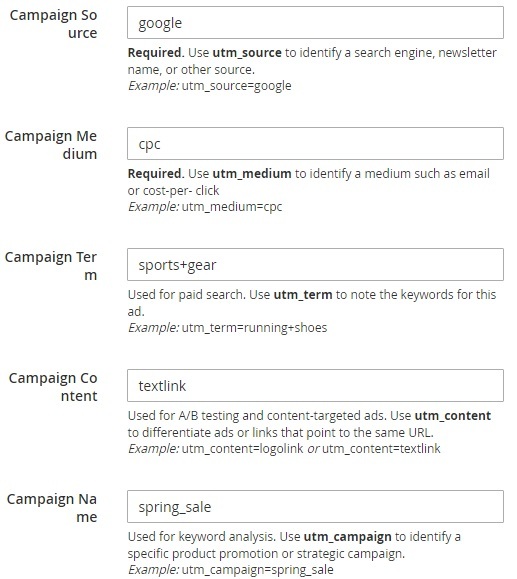 In Analytics, the Amasty Abandoned Cart Email Magento 2 extension allows specifying such parameters as campaign source, medium, term, content, and name. 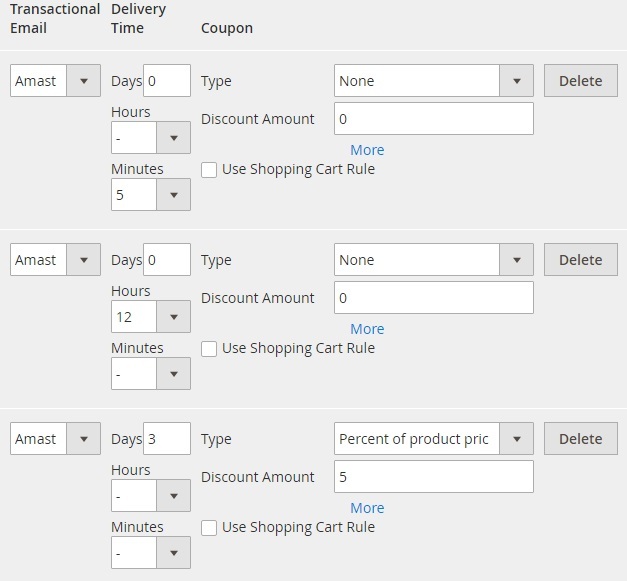 These parameters are enough to integrate your Magento 2 abandoned cart reminders with Google Analytics. The queue of all reminders is available under Marketing -> Abandoned Cart Email -> Emails Queue. Note that abandoned cart notification emails can be edited, as well as canceled in bulk here. As for email templates, you can find, modify, and create them under Marketing -> Communications -> Email Templates. 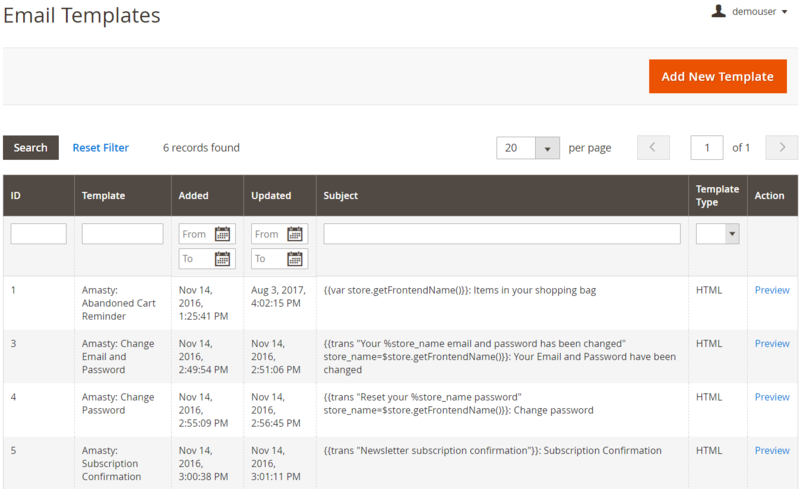 The grid shows a Magento abandoned cart email template ID, template, time of creation/update, subject, and type (HTML or text). From the Action column, you can preview your emails. While editing a new email template, specify its name, enter a subject (variables are supported), and create template content (variables are supported as well). Besides, it is possible to specify template styles. 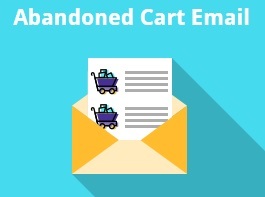 Under Marketing -> Abandoned Cart Email -> History, you can track rules, customer info, and coupons, as well as the status of an email to see if a recipient clicked on the link. We’ve already mentioned that it is possible to upload a file with blacklisted emails in the configuration section of the Amasty Abandoned Cart Email Magento 2 module. At the same time, you can blacklist email addresses manually under Marketing -> Abandoned Cart Email -> Blacklist. You only have to specify an email address that should be blacklisted and click Save. Now, we want to show you an example of how a reminder can be designed. It informs about the abandoned cart, provides contacts, offers a coupon code, shows products from the cart, displays new subtotal and a direct link to checkout, and allows a customer to unsubscribe from reminders. Compliance with the latest GDPR requirements was implemented. 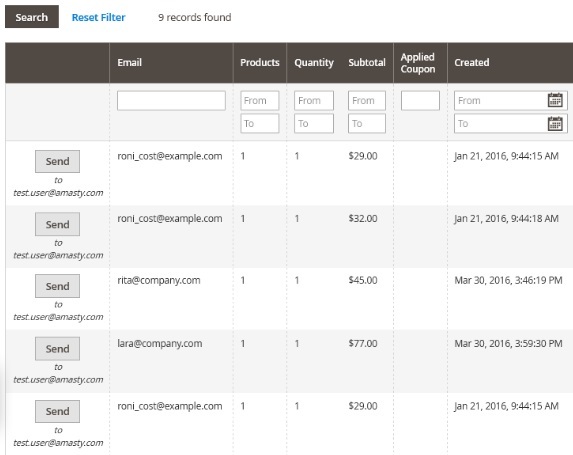 “Send the Same Coupon Again” checkbox added: coupon codes can be re-sent in subsequent emails. Log of the sent emails can be removed automatically now. A new function was added: ‘Reply to’ headers in email configuration. 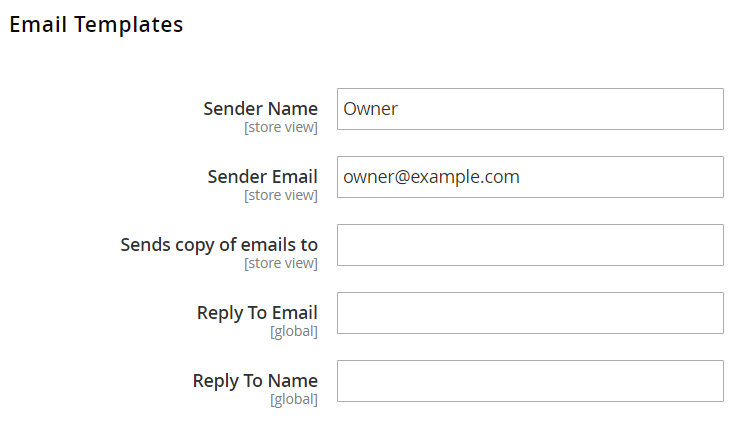 Email headers can be set on the per-store level. A new option was added: now you can show different greeting messages for guest and registered customers. New cancel conditions based on stock availability were added. Multiple Cancel Conditions can be used now. 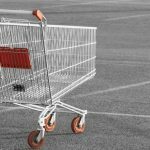 Cart abandonment is among the most common problems e-commerce merchants face every day. Cart abandonment rate is very high, and if you don’t take any action, it remains the same. Therefore, it is critical to use tools designed to reduce this poor index. Amasty Abandoned Cart Email for Magento 2 and 1 is among the cheapest but the most effective extensions that will bring buyers back to your store. The Magento 1 module costs only $89 with three months of free support. As for Magento 2 version, the extension’s price is $199. So, don’t hesitate to give it a try!